June spelt the opening of The Serpentine Pavilion’s Summer arts programme, which celebrates the great British outdoors, come rain or shine. This year the manicured lawns are playing host to a rather eye-catching artwork. Designed by the renowned Spanish architect selgascano, the futuristic structure has been erected in all its neon, glossy glory for visitors to wander around. 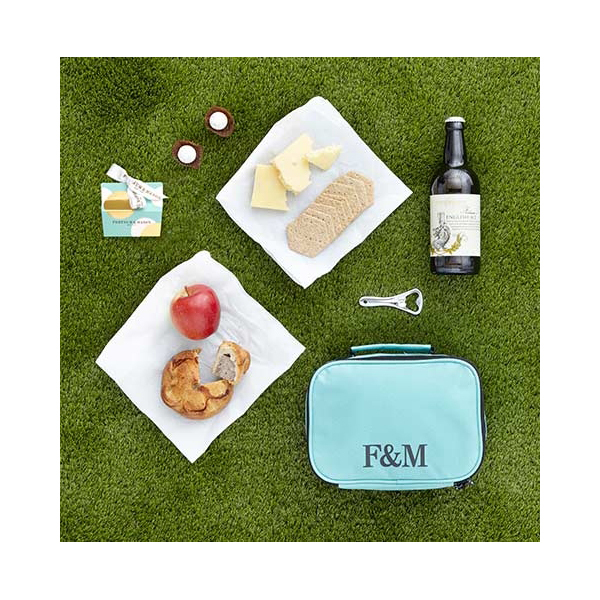 Fortnum & Mason, the most British of all brands, is providing the tempting food and drink at this English summer event. From the turquoise chairs filling the patio and the staff’s turquoise ties to the turquoise rickshaw and Fortnum’s cups, the whole area has been transformed into a public Fortnum & Mason tea party. Except Fortnum’s signature colour isn’t turquoise at all, it’s actually ‘Eau de Nil’, we’ll have you know. In true Fortnum & Mason style, the whole affair is brimming with Britishness. There are ‘Hamperlings’ on sale; a take on their legendary hampers, filled with finger sandwiches, macarons and cakes. Oh, and the famous spork, which will change your picnic-ing life forevermore. It was in this sunny spot that we met Sophie Allan and Sarah Burton, the eyes behind Fortnum’s sumptuous Accessories Department. Sarah is the Buyer for Men’s & Women’s Accessories & Loungewear, while Sophie works as the Buying Assistant. If you’ve ever popped into Fortnum’s Loungewear Department to pick up a pair of Desmond & Dempsey’s, you have these two to thank for the dangerously beautiful array of goods on sale. We met the two to talk favourite brunch spots, fashion finds and free food. We were sent away with an elegant Hamperling packed with patisserie and dainty cucumber sandwiches. Which we then dropped on the tube and trod into the stone floor. That’s what you get when you mix London’s most tasteful store with two of its most clumsy locals. SO HOW DID YOU GUYS COME ACROSS DESMOND & DEMPSEY? Sarah: I followed Desmond & Dempsey for a while on Instagram and loved its branding and products. The Loungewear Department was just about to be unveiled after an amazing new redesign and was going into a whole new space. We were on the lookout for more contemporary designers. WHAT REALLY STUCK OUT TO YOU ABOUT THE BRAND? Sophie: We loved meeting Molly and Joel, their energy is amazing. The fit is perfect, and the attention to detail is striking. The designs are very different but also so accessible. It’s crazy, it’s such a young brand but there’s already such a strong identity. Sarah: I think the Desmond & Dempsey story is really appealing. People are really responsive to that personal element. All the details of the pyjamas have been so considered, from the buttons to the handwritten note you get in each box. We have just worked with Molly and Joel on an exclusive print for this Christmas – the Howie pineapples in Fortnum’s Eau de Nil. They look amazing! DOES WORKING AT FORTNUM & MASON FEEL QUINTESSENTIALLY BRITISH? Sarah: Absolutely. The brand is central to so many British traditions and products. Working above the Piccadilly Store is great – it’s a very special place. Everyone seems to remember their first Fortnum’s experience. WHAT IS THE BIGGEST CHALLENGE WITH YOUR JOBS? Sophie: Fortnum & Mason is renowned for food, and the challenge is to remind people of our great beauty and fashion offering. Sarah: The offer has quite a curated feel, mixing both established classics with brand new young labels. So, what are your Sundays like? Sophie: I live in Camberwell and I have a small addiction to Lovewalk Café. My boyfriend and I seriously have to stay away from that place, because we’re spending all of our earnings there! If I go there for brunch I always have to have the sweetcorn fritters with halloumi and avocado. You come away from that place feeling so satisfied.. That’s where you’ll find me most Sundays…! Sarah: I love cooking, if I’m not out and about, I’ll cook breakfast or Sunday lunch. For breakfast recently, I’ve been making porridge with stewed plums and peaches. I’m trying really hard not to have bread at the moment so porridge is my go-to. Is not eating bread terrible? Sarah: Bread is kind of a big deal to me…you can try all of these alternatives but nothing beats the real thing. I had scrambled eggs on Sunday alone, it was so sad…! I love a classic white sourdough, there’s nothing better; I really miss it! What do you guys cook at home? Sarah: I have shelves full of cookbooks. I like knowing they’re there, but I always end up just going off the page and cooking by taste. If I’ve had a horrible day, I love getting home and cooking. I always find the time to do it, even if it’s really late. Sophie: I’m not as complex a cook as Sarah…I always call her and ask what I should make and she casually mentions ingredients I would just never have in my cupboards! We have to ask, do you get to eat amazing food working at Fortnum & Mason? Sophie: Yes! The Food Buyers receive samples daily, so taste tests in the office happen on a regular basis. Sometimes you really have to catch yourself and remember that you’ve eaten five macarons and three cupcakes in one afternoon!